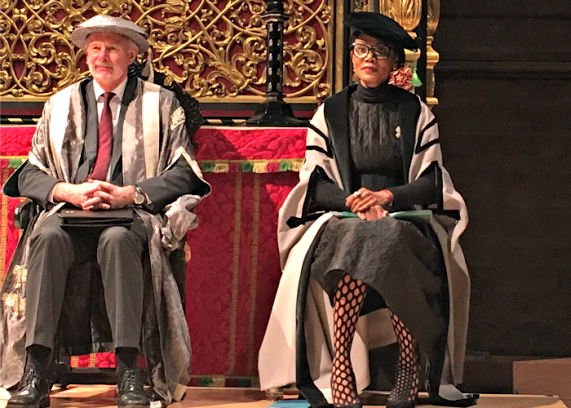 Vice-Chancellor, University Staff, Distinguished Guests, Graduates, Ladies and Gentlemen, family and friends, thank you so much for those kind words and indeed for this wonderful honour. 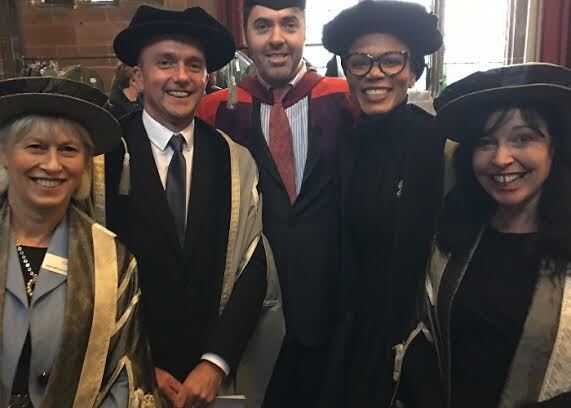 I’m very grateful, not just for this invitation to be an Honorary Fellow, but to be invited to share it with so many gifted individuals that it has been my pleasure to meet today. This fellowship is important to me because my father always wanted me to be a medical doctor. 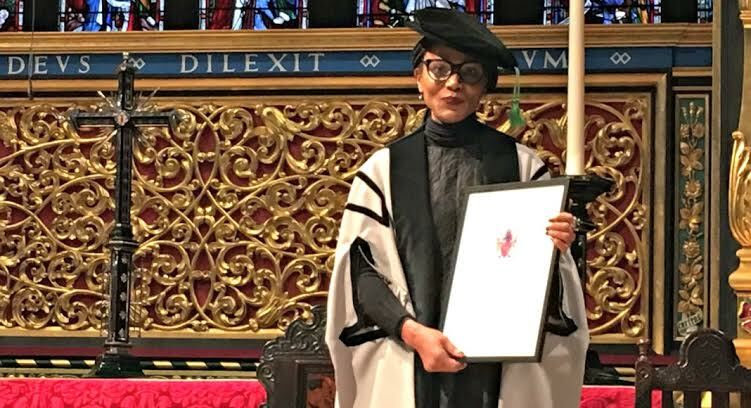 Since that wasn’t happening l thought l’d get a doctorate to please him but l never got round to it so perhaps he’d posthumously accept this in lieu. Also l have never worn a graduation gown so it was on my bucket list. 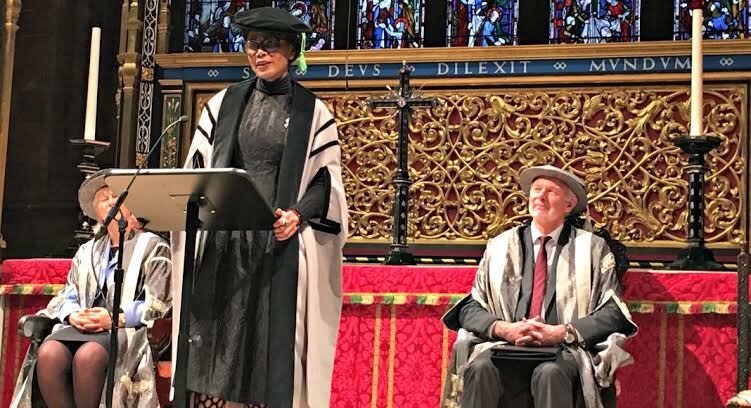 This lovely university is close to my heart because it has educated some of the people dearest to me, accepted my country men and women with warmth and provided me great opportunities to share my rather skewed world view. I am excited at the prospects of future opportunities for education that this fellowship will mean. Now let me share a few stories with you because stories are nice. Nothing ever went the way I planned, well almost nothing. I had planned to torment my mother with teenager angst but she died before I turned 10, ruining that excellent plan. At the beginning of this year I planned a major cinema project, a new TV show and a fashion school but then I fell very sick ruining that senseless plan. Last week my over thinking 14-year-old daughter Morenike asked if I thought there was an afterlife. I told her I doubted it but feel that’s in much the same way our current existence makes little rational sense and we cope without prior prep, so will we cope in an afterlife without further prep from here on were such an afterlife to exist. It must be my week of pointless questions because my friend John Maclean the kindest misanthrope in the world also asked how I have been able to do so many outstanding things despite limitations and setbacks. Because I like to confound him with Nigerian idioms, I told him the saying, “when in soup, lick it,” because I knew the idea of licking soup off one’s body would undo his tidy mind. It took years for me to understand that she was trying to teach me to repudiate ideology and dogma in favour of adaptability, functionality and multiplicity. In my culture, getting good education is non-negotiable so l was determined to go to university. I worked three jobs from age 15 to save up for university. When l walked into the lush fields of the prestigious University of Ibadan in Nigeria, l kissed the grass and shed tears. Four years later when l walked out, l didn’t even bother to collect my certificate. In my second year of university l had also walked out of the church of my youth. Granted l was tired of the bloody virginity requirement, being unaware that l could have lied about that like many wiser than me had. I walked out really because l was no longer convinced about the infallibility of the one way, the true way, the only way. I had begun to discover that for many things there are many ways, particularly for markets. I like markets; it is a place of human interaction, of pride in one’s product and hopefully fair exchange of products for needs. Good markets have clear functional rules that allow fair and equitable exchange. When kingdoms seek to overtake another, they break their markets and militarily surround them. Breaking markets is symbolic of a suspension of respect for negotiation, interaction and fairness. A conviction that one’s way is best and others are best following that one way. You may recognise that principle in modern foreign diplomacy as “our interests”. I hated school but loved education, I wanted to know things and discover things not be told things. I wanted to be a writer but I didn’t see how writers got paid. Since I hated asking anyone for money, I decided I’d be a journalist but my father wanted me to be a doctor because well, everybody’s father wanted them to be a doctor, also my father wished he was a doctor. He said doctors made money and were respected; journalists just get blown up or become impoverished. My father ate his words before he died five years ago, not because I didn’t get blown up, but because he liked to eat and words are nice. So as a journalist, I saw and reviewed the world. Recently a friend asked me what I thought about modern civilisation and I answered that we may have made magical technological leaps but I doubt that we have a civilisation. More importantly I have begun to think that a lot of what we know may not have been completely unknown to past generations; I am alarmingly beginning to suspect they chose not to unleash some of that knowledge because they recognised our interest must align with the earth’s interest. I have always thought that the greatest tragedy of civilisations lost around the world to slavery, colonisation and oppression is deprivation of our modern civilisation of alternative political, cultural and economic thought and systems, some of which were very sophisticated. My mind boggles when l listen to my friend Dr Bibi Bakare-Yusuf talk about the documented seven different pre-colonial forms of marriages in Yoruba culture. A culture evolved enough to be gender neutral without sloganising. So as I stand today in this gorgeous cathedral, suffused with a sense of history, of wonder and respect for those who have gone before us. Monuments like this emphasise how great our individual capacity is within the limit of our role in a never ending continuum of human endeavour. This is however not as scary as it may sound because when things no longer respond to plan, no matter how we posture or fight, it may be that we are in a large vat of soup with nothing but ourselves. It may be time to start licking that soup, not a very aesthetically pleasing solution, certainly not meant for TV but l bet it’ll be great on YouTube after all there is no one way to the market. That is my challenge to a new generation of leaders, thinkers and doers. 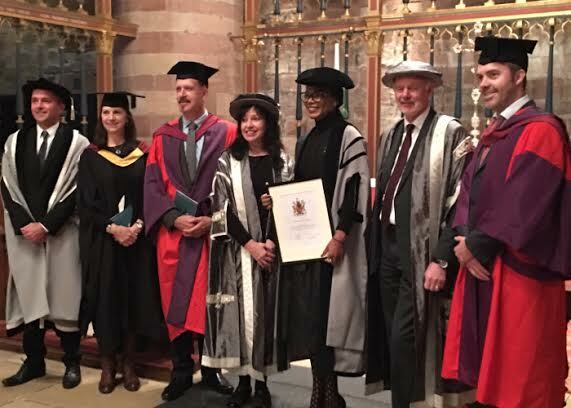 •	Ms Iyanda was awarded the Honorary Fellowship of the University of Cumbria at a ceremony held at Carlisle Cathedral in Cumbria, North West England on Wednesday, November 25, 2015.